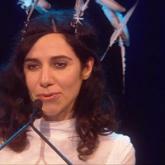 PJ Harvey has become the first person to win the Mercury Prize twice, with her album Let England Shake. The record, which was inspired by the horrors of war, was the bookmakers' favourite. Harvey won in 2001, when the ceremony was held on 11 September, but was unable to accept the prize in person because she was on tour in the US. Harvey said she wanted to make a record that was "meaningful, not just for myself but for other people". Accepting the award on stage she thanked the audience for "the recognition of my work on this album". The 41-year-old, who was the first female Mercury winner in September 2001 with Stories from the City, Stories from the Sea, said: "It's really good to be here this evening, because when I last won 10 years ago I was in Washington DC watching the Pentagon burning from my hotel window. "So much has happened since then. This album took me a long time to write. It was very important to me. I wanted to make something meaningful, not just for myself but for other people, and hopefully to make something that would last." Corinne Bailey Rae, who was one of the judges, said the panel all agreed that Harvey should be crowned the winner. "It was a tough decision, but were all in agreement." Bailey Rae explained that the lyrics made the record stand out because they were "really imaginative, almost cinematic". Harvey beat the likes of Adele, Tinie Tempah, Katy B and Elbow to the £20,000 prize. All the artists performed during the ceremony, apart from Adele who was suffering from a sore throat. Earlier on in the evening she had told reporters her outfit - a full-length white dress with a white leather bodice shaped like a strait-jacket - had been inspired by her album. The prize, which began in 1992, honours music by British or Irish artists and is based solely on the music on one album.